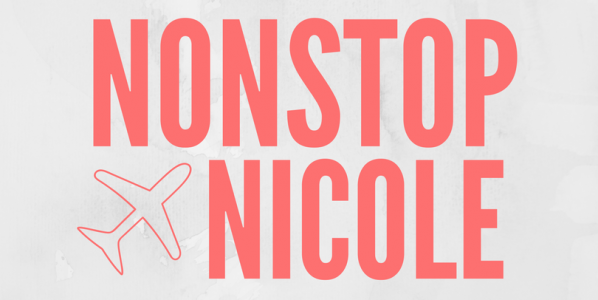 It’s been fun as “Nikki Knows Travel” and “Nikki Knows Flights” over the past year, but the name didn’t stick for me (and my ability to post frequently due to life changes and… dun…dun..dun… TRAVEL) so I’ve decided to make a few changes and it starts with my name! Nikki Knows Travel & Flights wasn’t something I was in love with. There wasn’t a story behind the name other than I know how to find travel and flight deals, but the name wasn’t something I was truly digging. But then, it clicked for me… someone said to me – “Nicole, I feel like you travel nonstop” and BAM, it hit me. Although I do not travel non-stop (I do it frequently), I do feel like nonstop has a few other meanings to me. So I introduce to you, Nonstop Nicole. NONSTOP Travel – As in, I only take nonstop (AKA direct flights with no layovers). This is NO LONGER true, but for years I refused to fly anywhere with a layover. What a rookie was I… layovers mean lounges and maybe extra miles (if you do it right). I am NONSTOP Journey – I want to keep exploring. Life is a journey filled with crazy experiences, ups and downs and hopefully moments of inner peace! I am moving NONSTOP – Not in the sense of moving from location to location, but I’m as busy as can be! Whether it’s traveling to my next destination, taking my fur-baby, Meko, for a walk, checking out the latest foodie hit in town, or just running to the local brewery – I’m just going, going, going! There are even more reasons why I like “Nonstop Nicole” and that it’s going to be my new name, but I’ll just start with those three for today and give you further insight down the road! There are some changes you will notice on my page starting tonight! New Logo: It’s probably temporary though, so don’t get too used to it. New Way of Sharing Content: Each day will present a theme unless I just need to share some really good info (like a CRAZY FLIGHT DEAL FROM MINNEAPOLIS TO HAWAII for under $400)! Shoutout Sundays: I am going to give a quick shoutout to a restaurant, business or place that I’ve absolutely loved that needs some recognition. Money Monday: It’s about saving money. Whether it’s a flight deal, tips or tricks on saving on trips, or a story about why getting bumped on a flight is a good idea – Monday will be primarily about ways to save you money during travel! Travel Tuesday: These are dependent on the Travel Deals that pop up that day (don’t worry, we will still share travel deals on other days of the week as well). But Tuesdays are often the best day to book a flight – so we’re going to help you take advantage! Wunderlust Wednesday: Highlighting a Travel Destination that gets the travel juices flowing! Travel Thursday: More features on flight deals today! Feature Friday: We are going to have longer posts featuring a hotel, restaurant, or experience that I’ve recently had! Show Me Something Saturday: This is a free for all! Whatever I’ve got to share, we’re sharing! Could be anything from a flight deal to travel experience to a weird photo of my dog. It will most likely be a travel tip or flight deal worth your while! Please bare with me as I make some adjustments to my site and know that this site is FREE for you and your friends. So please share my website, www.nonstopnicole.com, to anyone looking to travel the world, check out experiences, or just find a few life changing tips along the way. Previous Post FLIGHT DEALS TO HAWAII – $300s+ | Don’t Miss Out!